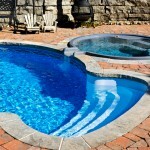 We are known throughout Mooresville, NC as the place to turn for high-quality swimming pool installation. Swimming Pool Installation in Mooresville – Swimming pool installation is a task that should be done with precision and strict attention to detail. At Lake Norman Signature Pools & Patios, we have the skills and experience required to make swimming pool installation a positive experience for our clients. Swimming pools add value. Whether you’re planning on moving out of your Mooresville, North Carolina home in the near future or you intend to stay for several years to come, installing a swimming pool in your backyard will significantly increase the value of your home. Backyard swimming pools are convenient. If you dread every summer because your children constantly ask you to take them to the public pool, having your own swimming pool in your backyard can save you from this hassle. Swimming pools enhance the appearance of your yard. Nothing is more beautiful in a backyard than a swimming pool with vibrant blue water surrounded by a visually appealing patio. At Lake Norman Signature Pools & Patios, we are known throughout the area as the place to turn for high-quality swimming pool installation. If you’ve always imagined relaxing, socializing, and playing with your children in your own backyard pool, let us design and install the swimming pool of your dreams. Contact us today for your swimming pool installation! At Lake Norman Signature Pools & Patios, we proudly offer swimming pool installation services in Mooresville, Cornelius, Davidson, Denver, Huntersville, and Lake Norman, North Carolina.